VIX has spent the past week beneath mid-Cycle support/resistance and the 200-day Moving Average at 16.63. Volatility shorts are having a field day again. However, VIX may have just made its Master Cycle low yesterday. It’s time to exercise due care. 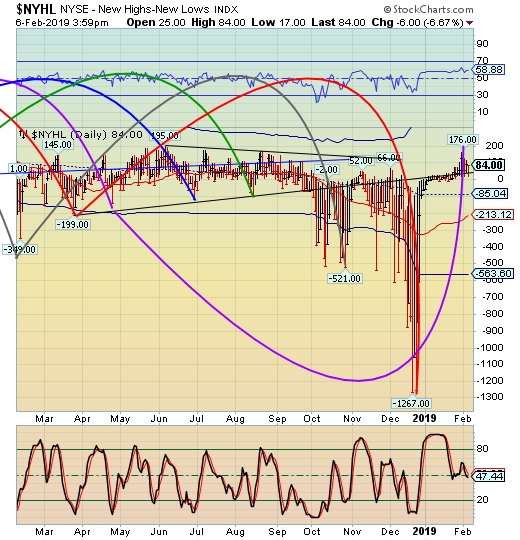 -- The NYSE Hi-Lo Index made an inverted Master Cycle high not seen since last July on February 1. The Cycles Model suggests that it is stretched and overdue for a strong reversal. (ZeroHedge) Stock markets are flying. Credit spreads are tightening in a parabolic fashion. It makes no difference whether it’s investment grade credits or high yield. Presumably, there isn’t a risk to be found in the world. Gold prices are showing definite signs of stalling without even testing the next area of resistance the metal was widely expected to blow through. Who can be bothered with safety? The most negative thing you will read is someone saying this is a tactical rather than strategic opportunity to ride carry to the first-half glory. And then have a look at yields on global sovereign debt to sober you up. There isn’t any way to explain the prevailing level of rates, other than people are scared amid all these upbeat prints on their screens. This has nothing to do with risk parity. Bond buyers aren’t hedging their equity longs. There is simply a presumption out there that the rate-hiking cycle is over. 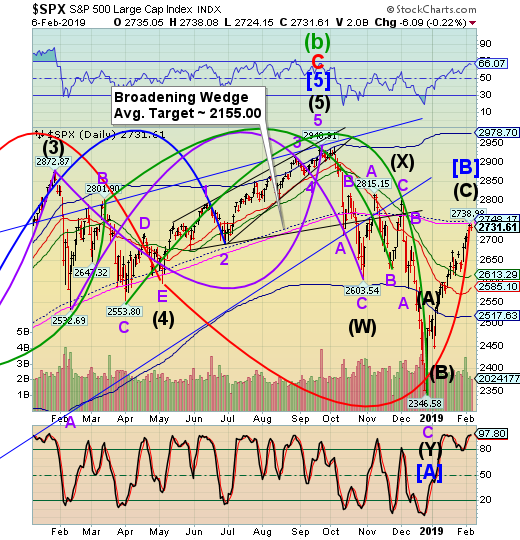 -- The SPX rally surged into its (inverted) Master Cycle high on Tuesday, stopping short of its 200-day Moving Average at 2742.08. Cycles require meeting both time and price targets. 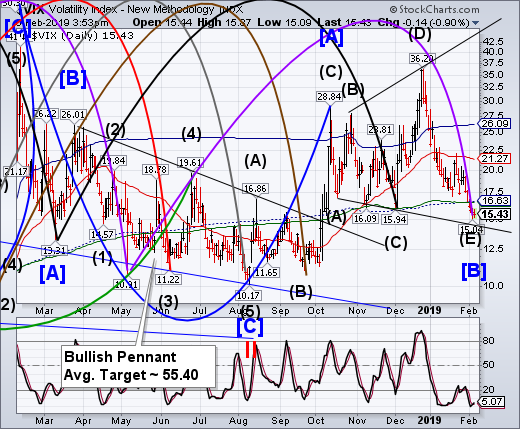 In this case, the time was extended to accommodate the price target. The next agenda item is a retest of the December low. (Bloomberg) U.S. stocks fell in thin trading as investors weighed corporate earnings against persistent concerns over trade and another government shutdown. The dollar extended its rally to a fifth day. The S&P 500 declined for the first time in six sessions with volumes below the 30-day average. President Donald Trump’s speech to Congress did little to remove trade and shutdown concerns, putting the focus on earnings-related moves. The Nasdaq composite slid along with Alphabet, while Electronic Arts and Take-Two plunged after disappointing numbers. Microchip Technology’s call for a bottom in the chip cycle boosted semiconductor makers. -- NDX may have completed its rally this morning by edging up to the 200-day Moving Average at 7040.62. Some analysts are predicting that it may go above that level. However, a major Pivot is overdue. Should it reverse, it will have completed the right shoulder of a new Head & Shoulders formation. 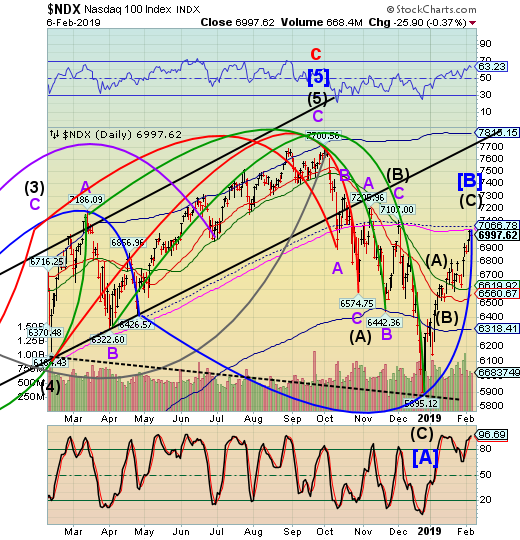 If valid, new downside lows may be made. 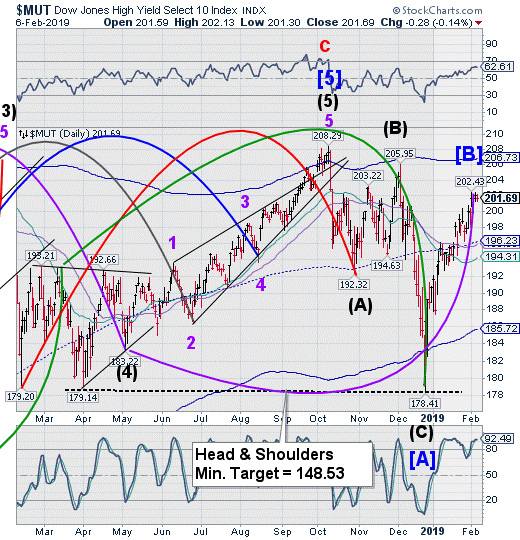 I will publish the target at the break of the neckline. (ZeroHedge) With sales of its signature iPhone slumping and CEO Tim Cook shifting the emphasis to Apple's booming services business, the company announced on Tuesday that long-time retail head Angela Ahrendt will be leaving the company after a five-year stint at the consumer tech giant. And on Wednesday morning, the company revealed that Ahrendt - who joined Apple from British fashion house Burberry - will be replaced by Deirdre O’Brien, currently the company's head of HR, who will now enjoy a new (if unorthodox) dual role as head of retail and people. Analysts greeted the news of O'Brien's appointment with enthusiasm, though some noted that her combined role could be a source of confusion. The High Yield Bond Index may have peaked at round number resistance at 200.00 on Monday. Since then it has consolidated near the high as it awaits the other indexes making their pivot.